You'd think a polish named after a pool would have a blue/green/turquoise base. Not this vixeny vivation (yes I just made that word up). This dark luring beauty has been staring at me from the shelf for awhile so I gave her a whirl. This is two coats of NOPI I'm a Pool for Love. A deep dark purple with duochrome glitter that flashes purple, blue and gold/brown. Just an FYI I put DOWN the new Sally Hansen 2012 Limited Edition Loves-me-not because I swear it is a dupe. If you don't have this NOPI then pickup SH Love-me-not, about the same price. 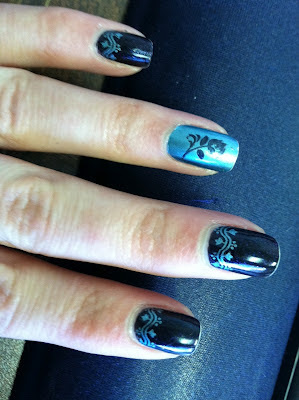 I then stamped the small flowery vine from m62 with China Glaze Adore. This metallic blue was so nice she went on in one swoop on my accent nails. I then used I'm a Pool for You to stamp these beautiful rose images from fauxnad plate K05. I love this! So chic and elegant!